“For the children of Israel are servants to Me; they are My servants who I brought out of the land of Egypt… Then, if you walk contrary to Me, and are not willing to obey Me, I will bring on you seven times more plagues, according to your sins” (Leviticus 26:21). “…Come out of her, My people, lest you share in her sins, and lest you receive of her plagues…” (Revelation 18:4). Those who are familiar with the Book of Revelation know that the number “seven” appears regularly in this book. John wrote letters to seven churches in Asia (Rev. 1:4, 11). One like the Son of Man stood in the midst of seven golden lampstands with seven stars in His hand (Rev. 1:12-13, 16). There were seven lamps of fire before God’s throne (Rev. 4:5) and seven Spirits of God (Rev. 1:4; 3:1; 4:5; 5:6). A scroll was sealed with seven seals. Seven thunders said things that weren’t written down (Rev. 10:3-4). The Lamb had seven horns and seven eyes (Rev. 5:6), and the dragon and the beast both had seven heads (Rev. 12:3; 13:1; 17:3, 7). There are seven mountains and seven kings (Rev. 17:9-10). 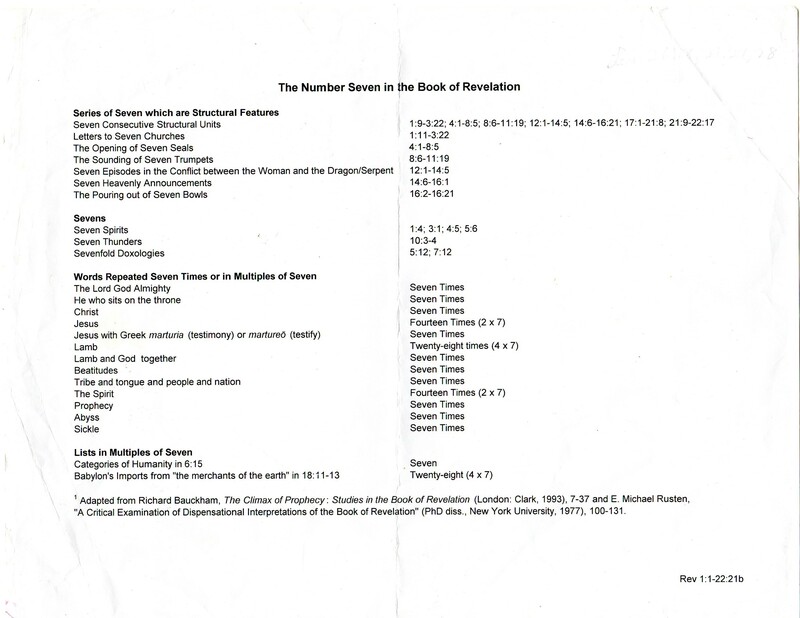 Perhaps most famously, the Book of Revelation features seven seals (Rev. 5:1-5; 6:1-17; 8:1-2), seven trumpets (Rev. 8:2; 8:6-9:21; 11:15-19), and seven bowls (Rev. 15:6-16:21; 17:1, 21:9). Why is it significant that these judgments came in sets of seven? “Babylon the great” (Revelation 17:5) was the recipient of these judgments (Rev. 16:19; 18:2-8). Babylon was also known as “the great harlot” (Rev. 17:1) and the “great city” (Rev. 17:18), which was first identified as the place “where also our Lord was crucified” (Rev. 11:8), i.e, Jerusalem. Babylon was responsible for the bloodshed of the saints, prophets, and apostles (Rev. 16:4-7, 17:6, 18:20, 18:24). This is the same bloodshed which Jesus said the religious leaders of Israel would be held responsible and judged for in His own generation (Matthew 23:29-36). “And after all this, if you do not obey Me, then I will punish you seven times more for your sins” (Lev. 26:18). “Then, if you walk contrary to Me, and are not willing to obey Me, I will bring on you seven times more plagues, according to your sins” (Lev. 26:21). “And if by these things you are not reformed by Me, but walk contrary to Me, then I also will walk contrary to you, and I will punish you yet seven times for your sins” (Lev. 26:23-24). “And after all this, if you do not obey Me, but walk contrary to Me, then I will also walk contrary to you in fury; and I, even I, will chastise you seven times for your sins” (Lev. 26:27-28). God called this the vengeance of His covenant (Lev. 26:25). Revelation is a book about covenants, a book about the transition from the old covenant to the new covenant. My post, “Echoes of Mount Sinai in the Book of Revelation,” details how the covenant imagery of Mount Sinai (Exodus 19) is present at the opening of the seventh seal, the sounding of the seventh trumpet, and the pouring out of the seventh bowl. Interestingly, when Josephus described the spoils of war that the Romans took from Jerusalem in 70 AD, he wrote, “…These lamps were in number seven, and represented the dignity of the number seven among the Jews” (Wars 7.5.5). “…I will bring on you seven times more plagues, according to your sins” (Leviticus 26:21). “…Come out of her, My people, lest you share in her sins, and lest you receive of her plagues… Therefore her plagues will come in one day…” (Revelation 18:4, 8). These plagues were poured out during the Jewish-Roman War of 66-73 AD in fulfillment of what God promised in Leviticus 26 and Deuteronomy 28, 32. The seven seal, trumpet, and bowl judgments of the Book of Revelation have nothing to do with our future and they were never intended for the entire planet. They were for the final generation of Israel, the crooked and perverse generation of Jesus’ own day. The apostles, prophets, and all of heaven rejoiced when this was accomplished (Revelation 18:20). Hi William. Yes, I have actually been leaning strongly that way as well. I just haven’t posted on it yet. Indeed, when I look at Revelation 20:4 and see who the people are who reign with Christ for a thousand years I notice that they were beheaded and refused the mark of the beast. So that tells me that they didn’t begin reigning until sometime during the 60’s AD. I agree with you that the Simon Bar Kokhba revolt seems to line up with Revelation 20:7-10. I have more studying to do on what actually happened during that time (132 – 136 AD). This, to me, is further evidence that the 1000 years did not end in 70 AD. Instead, it appears, they began around (a little bit before) that time. Does Micah 3:12 also describe what happened at the end of the Bar Kokhba revolt? William, I have a copy of “Josephus: The Complete Works,” translated by William Whiston. In Wars 7.2.2 (Wars of the Jews, Book 7, Chapter 2, Section 2) Josephus described the scene when one of the Zealot leaders, Simon Bar Giora, was captured by the Romans in 70 AD. Simon appealed to a Roman captain named Rufus, who interviewed him and reported his capture to Vespasian. Anyway, Whiston includes a footnote which says that the Talmud claims that Rufus fulfilled Micah 3:12 when he ploughed Jerusalem like a field in 70 AD and made Jerusalem become like heaps. It’s an interesting claim, in any case. Hello Adam, I enjoy your blog. The “killing power” of the Law is a great place to start with non Preterists as the judgements of Revelation are penalties under the Law, the prophecies of Revelation can’t, in my opinion, be fulfilled again unless the Law is reactivated. This was part of Darby’s dilemma … get the church out, then return to “Jewish Time” etc. Should caution be exercised in connecting Post AD70 events like AD135 to Old Testament prophecy? It could be argued that Micah’s word was not a penalty of the Law, but I’m not sure how successfully. Hi Al. Thank you for your comment, and I’m glad you enjoy this blog. I see what you’re saying. Maybe Micah wasn’t talking about what was going to happen in 135 AD. Maybe what he described in that verse actually happened in 586 BC when Judah was conquered by Babylon. Well, you certainly have me thinking on that one, my personal struggle has a lot to do with whether or not all prophecy is an Old Covenant innovation. As the deliniation between covenants includes the sense that we are no longer represented by man, prophets, kings, apostles etc I am hoping to understand how that works today. Thankfully my congregation is bearing with me on the journey. I should be working …. but …. what do you think about Adam Clarke’s comments on verse 12? Clarke’s commentary is pretty insightful concerning what happened under Titus, whether Micah spoke of that or not. Thanks. What do you think about it? The more I look at Micah’s words, while keeping in mind when he wrote them (around 737 – 696 BC, scholars say), the more I think he must have been referring to Babylon’s conquering of Jerusalem. He denounced the injustice and perversion of “the heads of Jacob” in his own day, and said that they would cause Zion to be plowed and Jerusalem to become heaps of ruins. I don’t think I should have suggested that Micah was talking about the days of Simon Bar Kokhba. Absolutely! whoever reads, let him understand? Spot on. I’m enjoying your site. I would like to point out something that may have not been brought to your attention before. Jesus was not crucified ‘in Jerusalem.’ We just accept whatever someone says without proving it and there goes the neighborhood. It was unlawful to crucify anyone in Jerusalem. He was taken ‘outside the camp.’ The walls of Jerusalem were the perimeter of the city. A deep valley divided the city from the Mt of Olives. There were synagogues in almost every city of the Roman Empire at that time and when Jerusalem fell, the ‘cities of the nations fell.’ This, to me, seems to be including the synagogues in this ‘city’ metaphor, a religious city in opposition to God. Hi Anna. Thank you, and I’m glad you’re enjoying this site. I understand what you’re saying about the location of Jesus’ crucifixion. I think that Jerusalem was considered as both a city and a metropolis, similar to the way that larger cities in the US are defined as having both city limits and a metropolitan area (e.g. Cincinnati, where I’m at, has a population of about 315,000 within its city limits, but the Cincinnati metropolitan area has a population of about 2.2 million). “Then behold, two men talked with Him, who were Moses and Elijah, who appeared in glory and spoke of His decease which He was about to accomplish at Jerusalem” (Luke 9:30-31). Other passages which suggest that His death would take place at Jerusalem include Matthew 16:21, Matthew 20:18-19, Mark 10:33, and Luke 18:31. I appreciate your thoughts about the synagogues in various cities. That’s something to think about and explore for sure. https://polldaddy.com/js/rating/rating.jsWhat do you believe the seven mountains in Rev. 17:9 represents?